Antarctic tourism activity presents legal and policy challenges for the Antarctic Treaty System (ATS). Bastmeijer (2003) argues that the Protocol on Environmental Protection to the Antarctic Treaty 1991 (Madrid Protocol) and domestic legislation do not effectively question the legitimacy of the many forms of Antarctic tourism. States Parties have only partially used the Protocol's environmental impact assessment (ElA) provisions for tourism proposals (Richardson 2000). The majority of domestic implementing legislation of state Parties has the role of authorising tourism activity (Bastmeijer 2003). Since 2001, there has been increased recognition at Antarctic Treaty Consultative Meetings (ATCM) of the need for additional measures to regulate Antarctic tourism. In March 2004, an Antarctic Treaty Meeting of Experts on Tourism and Non-Governmental Activities in Antarctica (ATME) was convened to examine tourism issues, including "jurisdiction, industry self-regulation; and an analysis of the existing legal framework and identification of gaps" (ATCM XXVI 2003). Subsequent ATCMs have extended the examination of emerging tourism issues and the associated regulatory directions. Australia's national legislation and administration of the region responds to obligations under the Antarctic Treaty 1959. Despite the relatively low demand for tourism regulation in the Australian Antarctic Territory (AAT),2 Australia has consistently worked with the Antarctic Treaty Consultative Parties (ATCPs) to achieve integrated management of Antarctic tourism. In response to emerging tourism issues, Australia has developed a tourism policy and argued for the implementation of schemes for industry accreditation and onboard observers, an Antarctic shipping code and sitespecific visitor guidelines (AAD 2004b). Australia (2005a) has also sought to establish ATCP policy on the development of land-based non-government infrastructure. 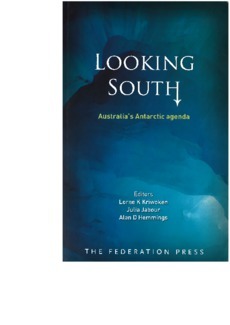 This chapter considers the emerging issues of Australian Antarctic tourism, through a critique of its legal and policy approach. An introduction of Australia's legal and policy framework precedes the analysis of increasing tourism activity, technological developments and land-based tourism facilities. This is followed by an examination of non-members of the International Association of Antarctica Tour Operators (IAATO) operating tourism companies or vessels from Third Party States. The chapter concludes with an outline of how Australia can adopt suitable legal and policy directions for tourism within the ATS.